The next time you can’t sleep, your brain whirring over shopping lists, tomorrow’s meetings and whether or not you locked the back door, the solution could be simple – move your mobile phone off the bedside table and out of your bedroom altogether. Eight out of ten of us keep our mobiles on overnight according to Ofcom, and around half use our phone as an alarm clock, a survey found. But experts are concerned about the effect this is having – at the very least it makes us ‘hypervigilant’ so our sleep is more likely to be disturbed and we end up not getting enough of the restorative sleep we need. But it might also trigger insomnia and other sleeping problems. Most people will sleep better if the bedroom is kept free of mobile phones and other electronic devices, says Dr Guy Meadows, insomnia specialist at The Sleep School, London. Dr Meadows leaves his smartphone in the kitchen at night. More controversially, there are suggestions that sleeping with your mobile by your bed may cause dizziness and headaches. The main problem with mobile phones in the bedroom is light, particularly the kind produced by the bright, high-quality screen on modern phones. It interferes with the body’s natural rhythm, effectively tricking our bodies into believing it’s daytime, according to Dr Charles Czeisler, a professor of sleep medicine at Harvard University. Light stimulates cells in the retina, the area at the back of the eye that transmits messages to the brain. The light-sensitive cells inform our body what time it is, explains Dr Meadows. All artificial light, whether from standard light bulbs or fluorescent strips, is thought to inhibit the release of melatonin, keeping us awake longer. But light from mobiles may have a greater effect. Why? Most of us think of normal light as white, but it’s made up of different colours of varying wavelengths, explains Professor Debra Skene, a neuroendocrinologist at the University of Surrey. And the light emitted by phones, tablets and e-readers contains a great deal of blue – this means it has a more stimulating effect. ‘We know that because of a pigment called melanopsin, the cells in the retina are most sensitive to blue light,’ says Professor Skene. 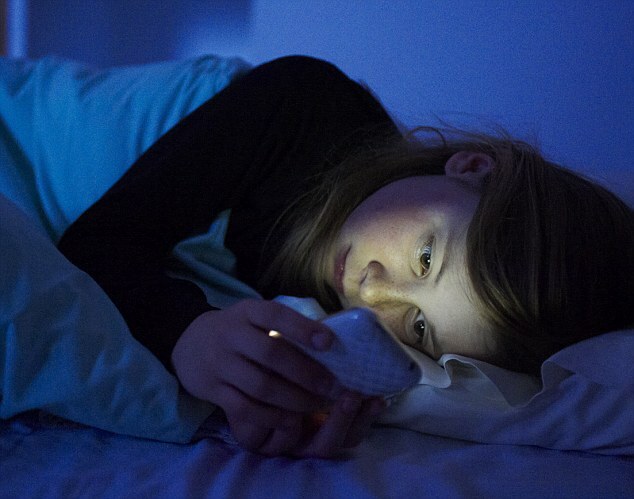 This is why reading something on a phone or tablet before bed could be more likely to keep you awake than reading a book with your bedside light – and it’s why sleep experts advise a ban on screen time two to three hours before bed. TV screens also emit blue light, but with mobiles the light source is closer to your eyes. Even short bursts of light – from a message alert or checking your phone – may have an effect. A 2011 study at Stanford University in the U.S. tested the effect of a total of just 0.12 seconds of light exposure during the night. Participants were exposed to pulses of light lasting two milliseconds each for an hour. This delayed the bodyclock and people became more alert. ‘This, along with other studies comparing intermittent and continuous light, suggests the first part of any light exposure is more effective on making the body more alert than the later part of light exposure,’ says Professor Skene. And because of the way we sleep, having a mobile by the bed means if we do wake up in the night, we’re more likely to stay awake. As Dr Meadows explains: ‘We sleep in cycles of 1½-2 hours, with brief moments of waking in between that normally go unnoticed. But in these brief waking moments, any outside stimulus has the potential to drag you out of sleep – for instance, a flash of light or vibration of your phone from a text message at the wrong moment could make you fully conscious. ‘If you then check your phone, you’ll be stimulating the cognitive parts of your brain, too – which really will stop you sleeping,’ adds Dr Meadows. Four in ten smartphone users say they check their phone if they’re disturbed by it in the night. ‘There’s not always something new or interesting every time you check your messages – but there might be,’ explains Tom Stafford, a lecturer in psychology and cognitive science at Sheffield University. ‘This has a powerful effect – even more than when we know for certain there will be something rewarding. So we want to check our phone more often than we rationally know we should – just in case.’ This ties in with what Harvard neuroscientist Dr Orfeu Buxton has described as ‘threat vigilance’ – because we’re never truly relaxed when our mobile is by the bed, we struggle to sleep properly. Sleep expert Dr Neil Stanley adds: ‘In order to get a good night’s sleep, you have to feel safe and not worried about anything. By having your phone close by at night, you’re subconsciously saying you wish to attend to that phone. Then there is the question of what your phone signal may be doing to your brain as you sleep. A mobile phone works by ‘talking’ to a base station using radio waves – a type of electromagnetic radiation. Radio waves are non-ionising radiation which means, unlike X-rays or radiation in cancer treatment, they do not have enough energy to change the structure of atoms. However, there is evidence that radiation may affect electrical activity in the brain during sleep. ‘We can now say that exposure to radiation before bed – at a level equivalent to making a call on a mobile for 30 minutes – does seem to lead to a small increase in electrical activity in the brain,’ says Dr Sarah Loughran of the Australian centre for electromagnetic bioeffects research at the University of Wollongong. A small 2008 study found that participants took an average of six minutes longer to reach deep sleep after being exposed to mobile phone radiation. They also spent an average eight minutes less time in the deepest stage of sleep. This is believed to be the most refreshing part of the sleep cycle. But if the scientists say they need more evidence for the effects on the brain, people who say they suffer from electrosensitivity do not. This is a controversial cluster of symptoms such as headaches, nausea, dizziness, tinnitus and sleep disorders blamed on electromagnetic energy from sources such as mobiles or wi-fi. Dr Andrew Tresidder, a Somerset GP, says he’s found some patients who complained of disturbed sleep or headaches improved once they switched their mobile phones off in their bedroom. But many researchers are sceptical and say we can’t say these symptoms are caused by so-called electrosmog. Dr James Rubin of the Institute of Psychiatry at King’s College, London, has reviewed research on mobile phone exposure and how people feel they’ve slept – 11 studies in total, during which participants were exposed either to radiation or a sham form while they slept; they were quizzed on how they felt in the morning. Professor Malcolm Sperrin, director of medical physics and clinical engineering at the Royal Berkshire hospital, adds: ‘There just isn’t the evidence to say radiation from your phone can affect your health in this way. But what the experts do agree on is that taking your phone to bed is not going to help you sleep. So if you’re struggling to switch off – switch it off.